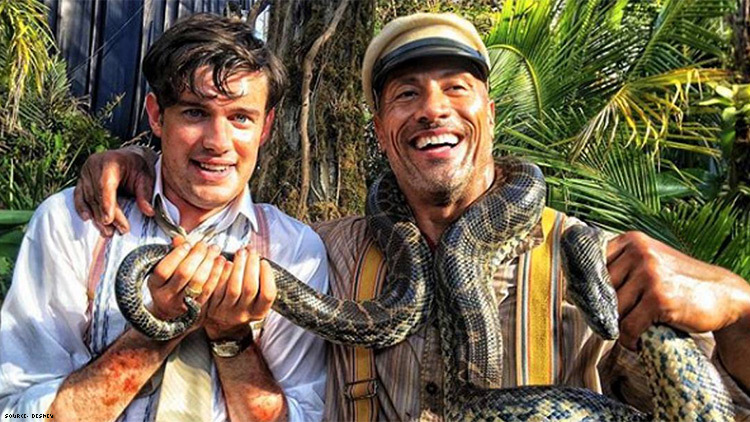 Jack Whitehall holds Dwayne Johnson's anaconda. Is this just Finding Dory all over again? The 2020 Disney film Jungle Cruise will feature a scene where a major character, Jack Whitehall’s McGregor, comes out, but test audiences say the film does not use the word "gay." TMZ reports that in the scene in question, McGregor discusses his romantic history and makes it clear he has no interest in women and that his sister, his only family support, accepts him regardless of the person he loves. But the character never explicitly makes clear he prefers men, and never utters the word "gay" or any other LGBTQ label. The film is a period piece, which may inform the character’s reluctance to be more direct about his sexuality. But it also opens the film up to more criticism for hinting at queerness without ever explicitly identifying a character as LGBTQ. Already, the film, purportedly Disney’s first action film to feature a major gay character, courted controversy in casting Whitehall, a straight man, in the role. Many already fear the McGregor character will end up a homophobic portrayal of a 19th-century gay man. It’s reminiscent of early news that the live-action adaptation of Beauty and the Beast would include a gay version of LeFou, but then the movie only hinted at his sexuality. Filmmakers offering mixed interpretations on whether the character was queer at all. Similarly, a trailer for Finding Dory excited LGBTQ audiences by showing two women who appeared to be a couple, but the final film showed the women appearing on camera for only a few seconds with their relationship unclear.